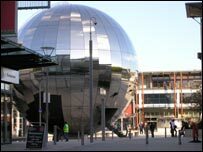 The University of the West of England (UWE) says it is interested in taking over Bristol's recently closed Wildwalk and IMAX cinema attractions. "It's a key site, lovely buildings and there are lots of exciting things we could do with it," said deputy vice chancellor of UWE John Rushforth. "There's the potential to support small creative industries and be part of the whole Watershed environment," he said. The buildings had formed part of the £97m Millennium Square development. Short-term funding and grants which the at Bristol centre received when it opened in 2000 came to an end or were significantly reduced by 2007 leading to the closure of both attractions at the end of March because they were not bringing in enough cash to cover costs. UWE, which has a significant amount of creative arts such as film studies, said it is keen to see the spaces used for public outreach work with schools. "The spaces they have there lend themselves to exhibitions," said Mr Rushforth. The university has had a look round the complex and is now considering what will go into its proposition ahead of being invited to submit its ideas. Other parties have yet to make their interest known but UWE said it was aware of competitors.